Happy New Year 2017! I know it is time to make resolutions and all that, but here are a few I am including: Forget the weight loss, I plan to GAIN fabric stash and finish at least four UFOs this year. How about you? Of course, that doesn’t mean that I won’t start some new and fun projects but it might be good to do a little digging and find old UFOs that need attention. 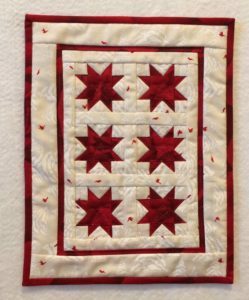 In the meantime, I want to share some little Star Quilts with you. 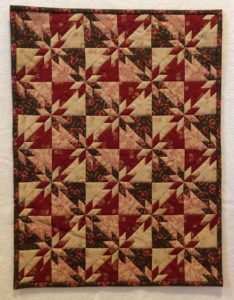 This little red and white (8.25” x 10.5”) star quilt just begged to be made last month and be put on a doll bed. It’s funny how I don’t often think of making a seasonal quilt until I am in the midst of the season and then it takes over and has to be done. Am I the only one? I hope not. 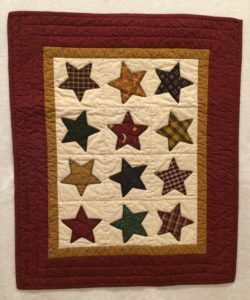 This next little Friendship Star quilt (13” x 16”) – to the right – was copied from my friend Jane Nelson. I was at her home in October for our Doll Quilt Divas group meeting and she had this one hanging in her studio. I just had to go home and reproduce it with wonderful civil war fabrics like she had done. I love the secondary Churn Dash pattern that emerges at the intersections of the sashing. This next quilt (to the left)I was able to purchase from the Alzheimer’s fundraising Auction website in 2013. It was made by Martha Wolfersberger from Montana. She calls it Star Bright (8.75” x 11.75”). It is an absolute miniature treasure. 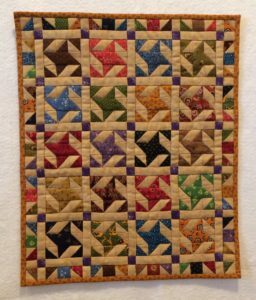 She has not only done amazing piecing but then she quilted it with variegated metallic thread, hence the name Star Bright. I think It is one of the best miniatures I have in my collection. There are so many wonderful and interesting star patterns that exist. The last two quilts I want to share with you are quilts that I made many years ago. On the left is an Appliqued star quilt and on the right, is a Hunter’s Star quilt. They are both just more examples of quilts that begged to be made, but I guess I’m a firm believer in Inspiration. When it hits and you think of a quilt to make – just Mak e It. You can enjoy it for years to come. P.S. 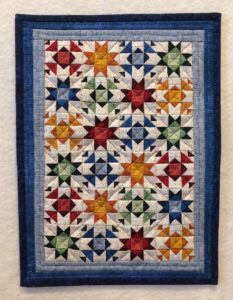 Don’t forget to sign up for 2017 Follow Along Colorado Log Cabin Medallion Quilt at Wooden Spools! ← Z is for Zauberballs, Zippers and so much More!